We are in full planning and reading mode this weekend. There are lots of exciting things going on behind the scenes here at Book Box Club HQ, which are testing our number crunching, designing, discussing, researching and emailing skills and have left us feeling very productive and business like! 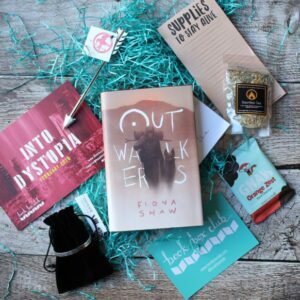 In amidst all of the planning excitement, we realised we hadn’t yet shown you all of the lovely things that we included in our February Into Dystopia box so we thought it was high time for a little show and tell! b.) Would have the chance to celebrate some of our favourite dystopian fandoms with some awesome box items! As always, we’d like to say a huge thank you to all of the lovely crafty people and small businesses that helped make this box great. Every month, we have so much fun choosing and creating items for each theme and we feel very lucky to have the chance to chat to so many talented people in the process. So, let’s have a closer look at all the items we included in our February box. Check out the links for more information about the featured creators. Scrolled Invitation: Escape the real world for the sanctuary of our cosy online Clubhouse, meet our other unashamedly bookish members and ask Fiona Shaw your burning questions about our featured February book. Arrow Pen by Book Box Club: Arm yourself for the end of the world with this mighty pen, inspired by our favourite dystopia dodging heroine, Katniss Everdeen! Bookish Goodies: A few little extras – check out these other brilliant, brand new YA reads, coming soon from our publisher buddies at Penguin Random House, Usborne Publishing and Gollancz. With thanks to our lovely members: @thebookloversguide @aspiderpigreadings, @floribundar, @becki_groves, @dyslexicreader, @bethsbookshelf and @behindgreeneyes83. 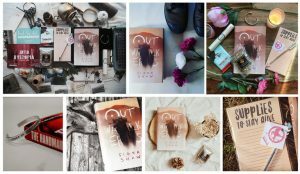 We have absolutely loved seeing your unboxings of our Into Dystopia box and I think we would all agree, Outwalkers is one very photogenic book (just check out some of our members photos above)! Thank you to all of you who have shared your pictures, blog posts, videos and comments with us – we can’t wait to see you in The Clubhouse very soon to discuss Outwalkers with Fiona Shaw herself. We just know there is going to be so much to say! We’d love to hear which of our Into Dystopia box items was your favourites too so don’t be shy; come chat with us over on your social media channel of choice; Instagram, Twitter or Facebook.